I think every thrifty home/home with kids should have a flower press. It brings so much pleasure over so many years and is one of those items that can last endlessly. When I was a child we used a very old heavy battered book to press our flowers. It was past being read but was big and solid enough to press our flowers ready for crafting. My daughter has a very simple thing cardboard paper with a little velcro. I am sure these would be very simple to construct yourself. They are fairly cheap though. 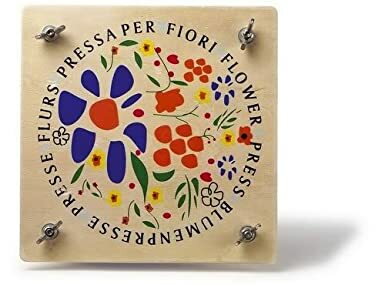 This Flower Press is wooden and has secure clamps and only costs around £10 from Amazon. Gorgeous. Flower pressing as a hobby and an art form has been around for ever and is as much fun for adults as for children. A friend of mines mother makes lovely flower pressed cards she sells in boutique stores, my 6 year old makes cards for poorly uncles and a very sweet and simple bookmark for Great Grandma. The love of flower pressing spans ages, generations. Arrange your flowers and leaves on the bottom part of the press. Don’t pick wild flowers use fallen ones. Use flowers and leaves that aren’t wet. Flowers with flat faces, like daisies, make good candidates for pressing. If you want to press a flower with a rounder shape, such as a rose or tulip,you need to gently break it apart and press one half of the flower flat. Leave your press in a dry press and check after a few weeks. Some great tips there–whenever I’ve pressed roses I’ve tried to flatten the whole thing. Never looks great, I must say. And once I found it mouldy, ugh. This is perfectly timed Becky! I was just talking to Kitty about flower pressing at the weekend and how we should try it! Mammasaurus recently posted…Wot No Comments? Great tips. I think flower pressing is great for keeping the memory of special flowers bought. Wow it looks great! thank you for reminding me to do this with my girls!